At Leeds United, Fabian Delph had no bigger admirer than Gary McAllister. McAllister invited him to train with the first team one morning and decided there and then that his academy days were done. When McAllister was sacked in December 2008, the club’s chairman at the time - Ken Bates - suggested that the ex-Leeds captain had struggled to relate to players with lesser or limited ability. No so with Delph. McAllister nurtured the midfielder and championed him relentlessly. Many hands were involved in the management of Delph - some at Bradford City, more at Leeds and the most recent around him at Aston Villa - and his full England debut in Switzerland last night was something his mentors would have put money on. “He’s the best player I’ve ever worked with,” Thompson says, “and that’s no disrespect to anyone else. With Delph it was always about ability. Appreciation of his performance in England’s 2-0 win over Switzerland acknowledged his aggression, his stamina and his boundless energy but the crux of Delph’s game is his technical skill. 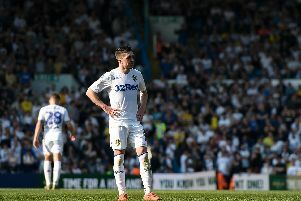 In his only season as a first-team player at Leeds, he went as far as humiliating others in League One - the improbable, 30-yard lob at Stockport County and the end-to-end goal away at Brighton. After scoring twice against Walsall in October 2008 and taking home the man-of-the-match award, the YEP’s match ratings remarked that Delph would “soon have more champagne than the French.” His only weakness was a habit of tackling like Paul Scholes. Leeds signed Delph from Bradford in 2001 and realised quickly that the 11-year-old’s development would depend on common sense and caution. Even now, at the age of 24, he has a small if deceptively strong build. Steve Claridge once described him perfectly in a scouting report for The Guardian, saying Delph had the physique of an “Ethiopian marathon runner”. Claridge was more wayward in predicting that the midfielder would “play a huge part in the resurrection of this once-great club” - unaware that Leeds might sell him before long. Thompson first encountered Delph when he took the job of academy manager at Thorp Arch in 2004. “He was with the Under-14s and I became aware of him quickly,” Thompson said. “Word reaches you when you find a player so good. Like a few others, everyone knew we had a gem there. “In the early days we treated him with kid gloves, using him sensibly, playing him below his age group on occasions. I know that caused Fab some frustration but he wasn’t the only one. Jonny Howson played down a level and it’s not unusual. It’s always done for the right reasons - for physical development as much as anything. Delph started 40 league games during the 2008-09 season, more than every player bar Jonathan Douglas and Luciano Becchio. He was so involved that an England Under-21 debut left him facing the prospect of playing three times in four days. McAllister had gone by the end of that term, replaced by Simon Grayson, and United’s chance of promotion evaporated too with a play-off semi-final defeat to Millwall. Delph collected League One’s young player of the year award and the fear that he might be too gifted or too restless for another season in that division was realised before long. It was anticipated that the income from Delph’s sale - around £8m - would ensure the repurchase of United’s training ground at Thorp Arch before a buy-back clause on the property elapsed three months later. But Leeds failed to meet the deadline and, throughout October, tried without success to convince Leeds City Council to loan them £6m. Council officials refused to commit any cash until Bates revealed the identity of United’s anonymous owners. Delph’s fee did little more financially than ensure a profit of £15,000 in the 2009-10 financial year but Leeds were promoted that season as he found his feet in Birmingham. The deal between Leeds and Villa included add-ons but the money owed from that transfer is understood to have been paid in full a while ago. Delph’s England debut will earn United nothing more.